I used the free LDraw system of tools to create most of the images and all of the building instructions in the ULMN Inventor’s Guide. 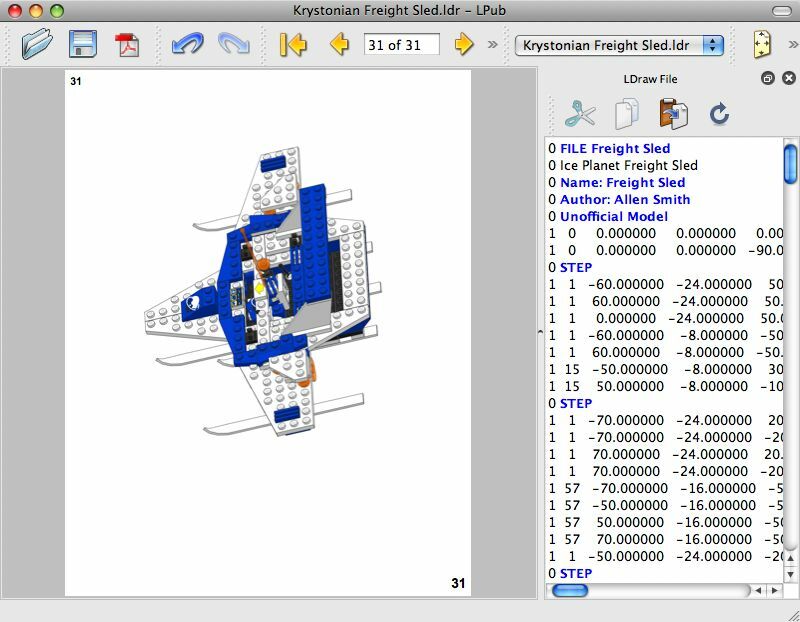 If you’re interested in learning how to create virtual NXT robots as well, the following tutorial shows how to set up LDraw on your computer and customize it specifically for NXT parts. Note that the most commonly used LDraw tool for creating models is the program MLCad (see image below). To facilitate the process of finding and selecting parts from the NXT set within MLCad, I’ve customized a “favorites” file used by MLCad, listing all the pieces in the retail version of the NXT set. The pieces are listed in the same order as found in Appendix A (LEGO MINDSTORMS NXT Piece Library) of the ULMN Inventor’s Guide. You’ll use this customized file in the tutorial. Note: If you already have LDraw and MLCad installed, skip to step 2. Step 1: Download the LDraw Tools Installer from the LDraw website. Once downloaded, open the file and follow the instructions. You can choose “Basic,” “Intermediate,” or “Advanced” installation. For this tutorial, only “Basic” is necessary (which includes the installation of MLCad). Step 4: Download the customized MLC_Favorites file by right-clicking on this link and saving the file to your C:\LDraw\Apps\MLCad directory. Since you are replacing an existing favorites files, you’ll be asked if you want to overwrite it–select “Yes.” Note: If you have already added favorite pieces within MLCad and want to keep them, you can copy and paste the contents of my file into your existing MLC_Favorites file. Step 5: Run MLCad and selecte File –> Scan Parts from the menu bar. MLCad might take a little while as it scans for new parts, and when it’s finished, it should ask you if you want to create a new Parts.lst file–select “Yes.” Finally, click “Favorites” from the list on the mid-left of MLCad. All the NXT set parts should appear below (see following image). Have fun! The best place to get more information about using LDraw is the LDraw.org website. 2. For now, the best way to add electrical cables is to use the “RJ12 Cable End” part. This part is simply the end of an NXT cable and signifies a complete cable (and prevents your model from looking messy!). 3. The turntable in the NXT set exists as two parts in LDraw (the “top” and the “base”). Simply put the parts together in the workspace in order to achieve a complete turntable. Creating building instructions for NXT robots can be a lot of fun. And it’s a great way to “preserve” your robots after you’ve taken them apart. 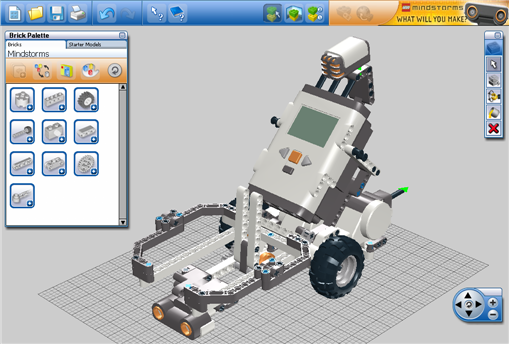 There are now a variety of ways to create virtual NXT robots and building instructions, but a quick and easy way to begin for either Windows or Mac OS X users is with the official and free LEGO Digital Designer (LDD) software. Since the capability to create NXT robots with LDD is relatively new, there are still some bugs to work out. But it does work. Version 2.3 of LDD was recently released, and you can visit http://ldd.lego.com/ to download the latest version. 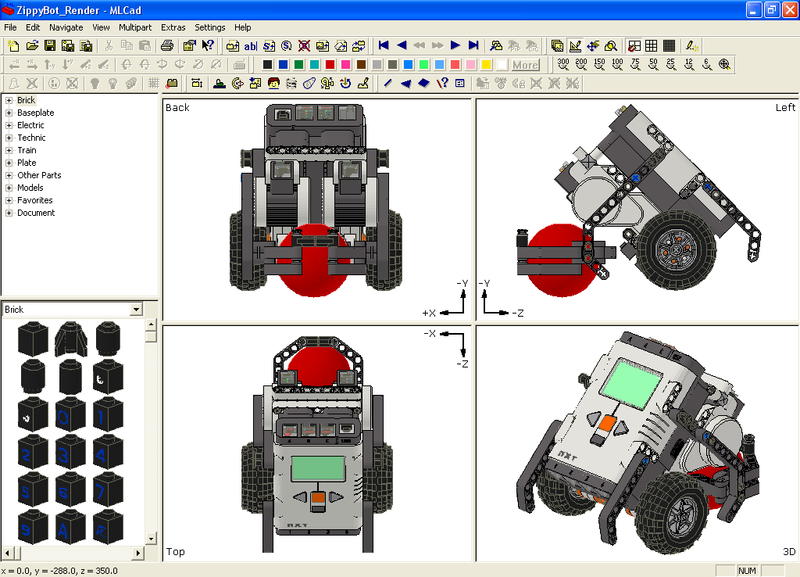 Note that I did not use LDD to create the building instructions in The Unofficial LEGO MINDSTORMS NXT Inventor’s Guide. Rather, for my book I used a set of tools based on the LDraw system.